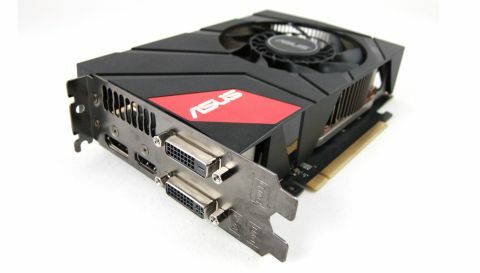 A brilliantly engineered card, at once cooler, quieter and quicker than the reference GTX 670. But the price is as prohibitive as the form factor almost irrelevant. I really, really want to love this diminutive new card from Asus. It's fantastically well engineered and at once quicker, quieter and cooler than the reference design card from Nvidia itself. It also fits in with the recent trend of squeezing top-end gaming performance down into mini-ITX form factors. A total graphics win, you'd have to say. Right? Well, sadly I just can't call it a win. And unfortunately that's because of a combination of an incredibly high price and the fact that really, honestly and truly, the size of this wee graphics card is practically irrelevant. First the good stuff though. This is Nvidia's second-tier consumer graphics chip, a cut-down GK104 GPU with 1,344 CUDA cores and a Boost clock topping the 1GHz mark. It's also got a healthy 2GB GDDR5 memory and a decent 256-bit bus to help keep the data flowing. That all gives it some great performance chops, and because of the overclocked nature of this GTX 670 it posts better gaming benchmark numbers than the reference GTX 670. That overclocking is impressive given the small size of the PCB, cooler and heatsink design. Asus' DirectCU cooling array has been impressively re-engineered to fit this smaller form factor and still manage to dissipate more generated heat than Nvidia's own coolers. All this said, it's a bit of a surprise we haven't already seen a physically chopped down version of the GTX 670. The reference card Nvidia sent me at the GPU's initial launch only has a PCB measuring just 173mm. The rest of its length is taken up by the cooler. The PCB on the Asus GTX 670 Mini is only a little shorter still at 170mm. I can only conclude that other companies have struggled to get the sort of cooling performance Asus are hitting with their excellent DirectCU. It's either that or the fact that other manufacturers realise the length of the card is almost irrelevant to fitting a graphics card into a gaming-focused mini-ITX chassis. Cases like the lovely Bitfenix Prodigy and the functional Cooler Master Elite 120 are tooled-up for mini-ITX components and yet are still capable of housing full-length, dual-slot graphics cards. If you want a mini-ITX case smaller than that you're going to need a half-height GPU and I doubt even Asus' capable engineers are going to be able to create cooling and circuit board designs to house the likes of the GTX 670's GPU. So there's not really a lot of point in picking up the GTX 670 Mini for the size alone, and Asus' own full-size DirectCU GTX 670 is around the same price and clocked even higher. That price then is a real sticking point. The fact you can also pick up Sapphire's overclocked, super-cooled HD 7970 GHz Vapor-X card for less than the cost of this second-tier card then makes it almost impossible to recommend this otherwise brilliantly engineered card. All of the following tests were carried out on our test system with a stock-clocked Core i7 3770K on an Asus Sabertooth Z77 with 16GB 1,600MHz RAM. I test at both 2560x1600 and 1920x1080 resolutions with the highest settings and 4x MSAA. The initial figure is the average frames per second score and the number in the brackets is the minimum frame rate score over the duration of the benchmark.